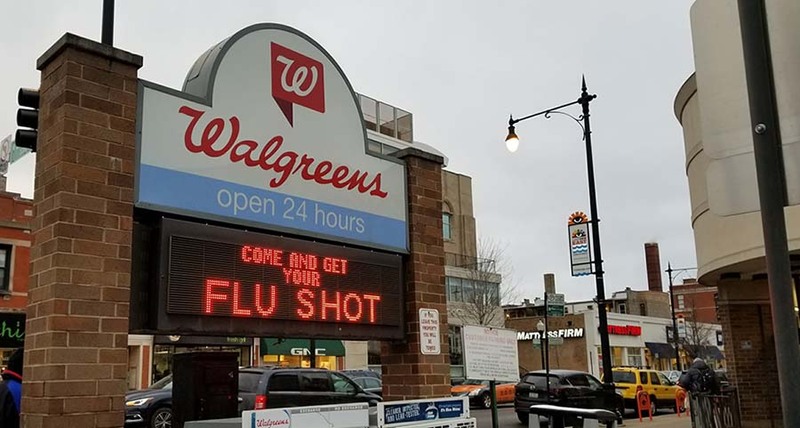 Liz Solheim waited to pick up a prescription at a Walgreens in Lakeview Tuesday evening, where the sign out front announced, “Come and get your flu shot” in red LED lettering. She had not gotten a flu shot this season, and doses of the flu vaccine were available for sale. It could not have been easier to get the shot, but Solheim, 30, was not interested. “I guess my mind was sort of already made up,” she said of her decision to remain unvaccinated. While she knows people who have contracted the flu this season, including her employers and some friends, Solheim is comfortable taking her chances. “I don’t really get sick that often,” she said. Those, like Solheim, who have not been vaccinated against the flu this season, are the intended audience of a news release published by the Chicago Department of Public Health Tuesday, which emphasized that it is not too late to derive protections from the vaccine. The flu vaccine “decreases the severity of illness and the duration of symptoms,” said the release, drawing similarities between the seasonal patterns of the current flu epidemic and the 2014-2015 flu season, which the Centers for Disease Control and Prevention noted was longer than usual. CDC predicted there are still many weeks of elevated flu activity left, according to the release. Pharmacists at a number of Lakeview pharmacies said that there are still customers coming in for flu shots. Several CVS branches have run out of the vaccine, but pharmacies at Walgreens and Mariano’s still had doses available on Tuesday evening. Pharmacist Brianna Goen of Mariano’s Pharmacy on North Broadway in Lakeview said that at least seven people had come in for flu shots since the beginning of this week and that Mariano’s is making sure to keep the vaccine in stock. Colleen Pacanowski, 32, was vaccinated in October. She said that some years she misses the window for vaccination, but this year she “just happened to have the time,” adding that most of her friends do not get the flu shot. Both Pacanowski and Solheim indicated that their upbringings contributed to their choices around vaccination. In contrast, Pacanowski said that her mom, who worked in a health profession, always encouraged her to get vaccinated.